That's really cute, but I dunno, it looks like a photoshop to me. 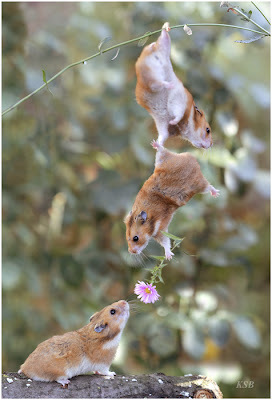 The hamster holding the flower isn't really holding it, its paw isn't closed. Plus, the one holding the branch-look at his foot, what happened to the digits? One last thing, what are hamsters doing outside anyway? ok, my bad, it looks like most of the pics on this blog are shopped. i should have kept my mouth shut!